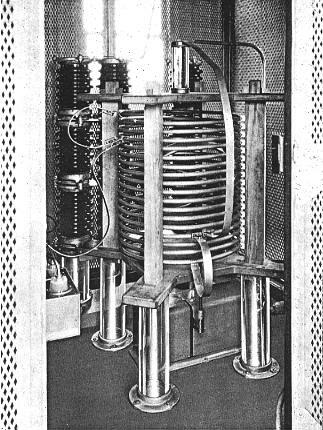 Coil mounting device insulated by special PYREX Pillar Insulators at Broadcasting Station WLW. This station, owned by Crosley Radio Corporation, is one of the newest, finest and most powerful in the country. PYREX Insulators are used throughout. "We have been using PYREX Insulators for the past four years, and have been heard in every state in the United States with the exception of three, on 250 watts power." -- F. E. Madden, Engineer, Broadcasting Station WDBJ, Roanoka, Va.